Makruk is the variant of chess most played in Thailand. It is regarded as the most similar living game to the common ancestor of all chess variants: Chaturanga (very closely resembling Davidson's variation). Makruk is a chess variant that starts off as a war game between two sides with equal material, but which later on (in the end-game) incorporates concepts of pursuit and escape games (like Hnefatafl); as one player (the disadvantaged-side) becomes the defender and his/her goal turns from pursuing to checkmate, into escaping from a checkmate by the stronger side (the attacker), by means of special counting rules that aim to force a draw to end the pursuit. Makruk Preset 3 with western chess pieces, upside down Queens and Bishops (the pieces with non-orthodox movement). Upside down Pawns for Promoted Pawns (Biagai) are available. The Thai King (Khun) moves like in orthodox chess, one square in any direction. The Thai Queen (Met) on the other hand, is a lot less powerful that it's orthodox chess counterpart. In Makruk the Queen moves like Chaturanga Counselors as a Ferz, only one square diagonally. The Thai Bishop (Khon or Thon) moves one square either diagonally or straight forward. Both Burmese Chess (Sittuyin) Elephants (Sin) or Japanese Chess (Shogi) Silver Generals (Ginsho) move as Siamese Bishops and are valid piece equivalents. The 5 dots on the Alfaerie Shogi piece indicate the movement of a Silver General and the moon is the alchemy symbol for silver. 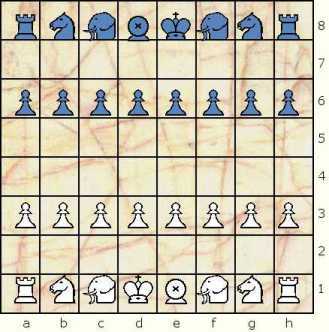 Thai Rooks (Rua [Boat]) and Knights (Ma [Horse]) move identically to their Orthodox Chess counterparts. The Knight is the only piece capable of jumping over other friendly or enemy pieces. Thai Pawns (Bia [Cowry Shells]) move and capture just like their Orthodox Chess counterparts; one step foward for movement and diagonally to capture. Pawns start up on their 3rd rank and do not have a 2-step initial move, consequently there is no en passant rule. Pawns promote upon reaching their 6th rank. Promoted Pawns (Biagai [Promoted Cowry]) move like a Met (Queen, one step diagonally forward or backwards). In the example below the h-pawn can move to h6 (or capture at i6) and promote to a Queen. For the stronger side, to checkmate the opponent's King. At the beginning of the game, since both sides are even in material, they both aim to checkmate the opponent to win the War (game). Later on (as the result of the opening, middle-game and early end-game sections of the game) the player with the material advantage becomes the stronger side and is still aiming for checkmate. 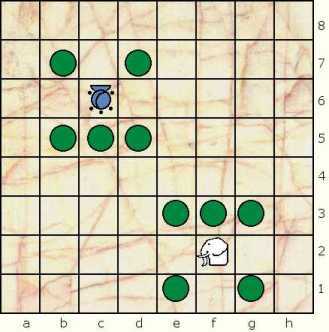 However (later in the end-game) the game turns from a War game into a Pursuit and Escape game, where the weaker side's objective is to force a draw by means of special Thai counting rules. Many games of makruk end in draws. This is because late in the game, the concepts of pursuit and escape become very important in Makruk. There are special counting rules in the endgame which permit the disadvantaged side (the escaper) to claim a draw against the pursuer (the stronger side). A stalemate is a draw in Makruk. Draws can also take place by agreement of both players, as in Orthodox Chess. When neither side has any unpromoted pawns left on the board, the game must be finished within 64 moves, or it is declared a draw. 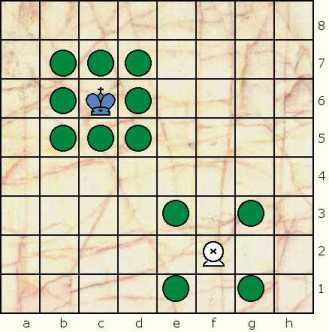 The player in disadvantage counts the moves up to 64 (the number of squares on the board), and is allowed to stop counting if he or she no longer feels at disadvantage. If the player at a disadvantage is able to make the 65th move without been checkmated, the game is a draw. If the disadvantaged side checkmates the stronger side and did not stop counting, the game is declared a draw. The count does not restart unless the disadvantaged side had stopped counting and would like to start counting again. The count is not restarted when the side at disadvantage performs a capture. When one side is left with a bare or lone king (right after his last piece is captured), the counting is restarted. This time, the count required to mate is calculated in a special way based on the material available to the stronger side, and the number of pieces left on the board. 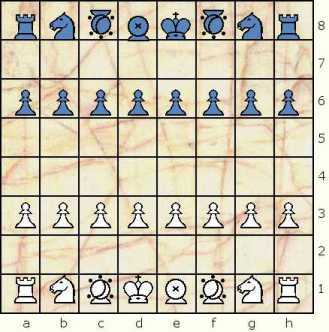 Second, substract from the number of moves above the number of ALL pieces left on the board (both sides). This is the new number of moves required to mate, before the game is declared a draw. For example, if a side has king, two rooks and knight versus a lone king, the stronger side must deliver mate in 8 (two rooks) - 5 (five pieces) = 3 moves, or the game is declared draw. The count would start at 6 (5 pieces + 1) and goes to 8; or alternately from 1 to 3. If a side has king, bishop, two queens and a pawn versus lone king, the stronger side has 44 (at least one bishop) - 6 (six pieces) = 38 moves to deliver mate, before a draw is called. The count would start at 7 (6 pieces + 1) and goes to 44; or alternately from 1 to 38. Unlike the 50-move rule in orthodox chess, in Makruk the count does not restart if the bare King performs a capture. Point of clarification: The count under the Bare King - The Pieces' Honor Rule is restarted regardless of any current running count under the Pawnless Games - The Board's Honor Rule. Therefore it is possible for the new count to reach under the Bare King rule to be higher or lower, than the previous running count under the Pawnless Games rule, which is totally scratched. Original set on the left built by Gary Gifford, composed set on the right by Jose Carrillo. 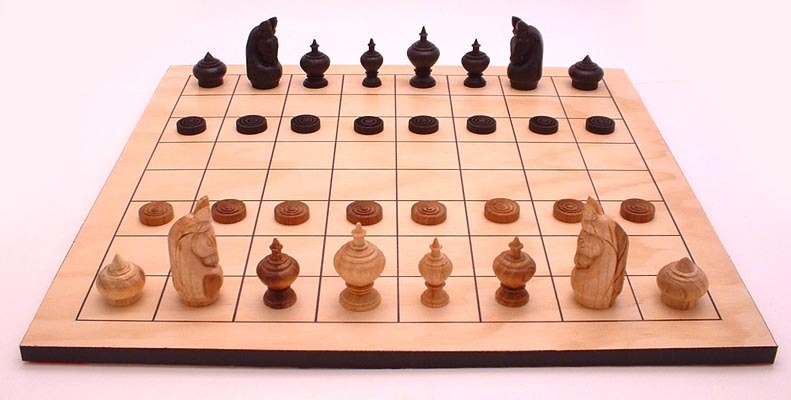 The Carrillo set uses the Kings, Knights and Rooks from a standard chess set; homemade Prime Ministers as Chaturanga Counselors for the Thai Queens; Seirawan Elephants as Burmese Elephants for the Siamese Bishops; and Checkers (Draughts) men for the Makruk Pawns. The Pawns are smooth on one side, and decorated with concentric rings on the other side to represent promoted pawns (biagai). Another homemade sculptured Makruk set by Gary Gifford. Set composed by Jose Carrillo. Upside down Queens and Bishops for pieces with non-orthodox movement. Upside down Pawns represent promoted pawns (i.e. pawn at h4 in sample mate position at right). This set inspired the 3rd Game Courier Makruk Preset above. Makruk in the West in action! To see actual games that have been played on-line in the CV Game Courier, follow the link above. Makruk (Thai chess). Play the traditional Chess variant of Thailand on Game Courier. I'm sure no one living is the inventor of Makruk. So I updated the inventor field for this page to none. ... but I got it! Just out of curiosity, very recently I started to play the Viking game Hnefatafl, a pursuit and escape game that more closely resembles Latrunculi (because of the custodial capturing method) than Chess. What can be initially striking to chess players is that in Hnetafal, players have different size armies and goals to end the game. 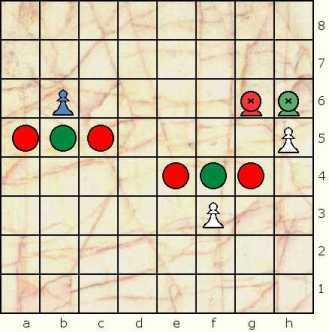 One side (the attacker with the superior army) aims to pursue and capture the opponent's King, while the other side (the defender) aims for his/her King to escape capture by reaching to the edge of the board or a to corner square to win and end the pursuit. Then I read Sittipon's (who seems to be Thai) posting again, and again: "In Makruk, pursuit and escape is very important..."
and (thanks to the different goals feature of Hnefatafl) I got an aha moment as it regards to the Thai Draw Counting Rules. Some chess players, who are more used to a simpler 50-move draw rule, think: "Why complicate ourselves with the nuissances of the complicated Thai draw counting rules? They don't make sense anyway." While other chess players (including myself) just don't question the rules and take them for granted: "These rules are there for a reason and they are part of the game, period." Sittipon's hidden message gives us a clue to theorize the reason to be of the Thai Draw Counting Rules. Makruk is a war game, in which during the opening and the midgame, both players have similar or equal armies, and their objective is clear: to destroy their opponent's army and checkmate the enemy King. 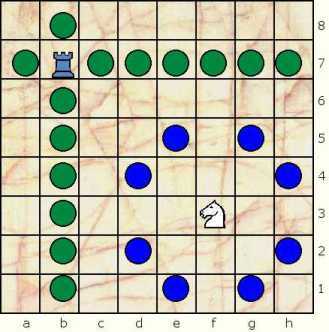 However later on (in the end game), the game morphs from a war game to a pursuit and escape game, in which one player (thanks to his/her superior material advantage) becomes the attacker and still aims to pursue and capture (checkmate) the opponent's King; while the other player (the defender) now aims to escape capture and (thanks to the draw counting rules) earn a draw to end the pursuit. Hnetafal helped me to connect the dots potentially explaining the transformation of Makruk from a war game to a pursuit and escape game. Thanks again Sittipon! The reason of the Thai Draw Counting Rules is now perfectly clear (at least to me)! This page is accessible from http://www.chessvariants.com/page/MPmakruk-thai-chess So, it looks like the problem with viewing /play/makruk-thai-chess is with the msdisplay.php script used on the Play subdomain.